Chocolate Sugar Cookies frosted with Royal Icing are not only beautiful to look at but are delicious to eat. They are sweet and buttery with a subtle chocolate flavor that comes from adding unsweetened cocoa powder to the dough. There are two ways to decorate these cookies; one is to simply sprinkle the unbaked cookies with crystal or sparkling sugar. The other way, which has become very popular, is to frost the baked cookies with royal icing. What I like about Royal Icing, as opposed to Confectioners Frosting, is how it dries to a wonderful smooth and hard matte finish. Royal Icing can be made with powdered sugar, egg whites and lemon juice or with meringue powder and water. I prefer the taste of royal icing made with egg whites, but if you are concerned about the risk of salmonella, I have also included a recipe for royal icing using meringue powder. If you are unfamiliar with meringue powder, it is a fine, white powder that contains dried egg whites, sugar, salt, vanillin and gum. It can be found at most cake decorating and party stores or else on-line. It is important when working with royal icing to keep it covered as much as possible as it dries out very quickly. Another way to prevent a crust from forming on the icing's surface is to add a few drops of glycerin (glycerol) to the icing. Glycerin is a sweet, odorless, clear, and syrupy liquid (chemically an alcohol) that comes from fats and oils. It is available in cake decorating and party stores (like Michaels). Once you are ready to frost your cookies you want to make sure the royal icing has the proper consistency. Too runny and it will run over the sides; too stiff and it won't spread nicely. So, for the right consistency to cover (or flood) the cookies, first test the icing by lifting your spoon and letting the icing drip back into the bowl. The proper consistency is when the ribbon of icing that falls back into the bowl remains on the surface for about 5 seconds before disappearing. Another way is to take a cookie and place a small amount of icing in the middle of the cookie. Using a small knife or spatula, push the icing to the edge of the cookie. If the icing runs off the edge, thicken the icing by adding a little more confectioners sugar. Do not add too much sugar at once. You want the icing to spread smoothly but don't worry about a few light streaks. They will disappear as the icing dries, and be aware that the icing can take several hours, or even overnight, to dry completely. Lastly, let's talk about which type of food coloring to use. Personally, I like the concentrated gel paste dyes that are sold in small 1/2 or one ounce (14 - 28 grams) containers. Only a very small amount is needed to color the icing, and I measure it out using the end of a toothpick. Make sure to thoroughly mix the paste into the icing as you do not want streaks. You can buy gel pastes at cake decorating stores or craft stores. Chocolate Sugar Cookies: In a large bowl whisk together the flour, cocoa powder, salt, and baking powder. In the bowl of your electric mixer (or with a hand mixer), beat the butter and sugar until light and fluffy (about 3 minutes). Add the eggs, one at a time, beating well after each addition. Scrape down the sides and bottom of your bowl as needed. Add the vanilla extract and beat until combined. Add the flour mixture and beat until you have a smooth dough. Divide the dough in half and then roll each half between two sheets of parchment or wax paper until it is about 1/4 inch (.5 cm) thick. As you roll, periodically check the top and bottom sheets of parchment and smooth out any wrinkles. Then place dough on a baking sheet (along with the parchment paper) and place in the refrigerator until cold and very firm (about two hours or even overnight). Preheat oven to 350 degrees F (180 degrees C). Line two baking sheets with parchment paper. Bake cookies for about 10 - 12 minutes (depending on size) or until they are firm around the edges. Remove from oven and let the cookies cool on the baking sheet for a few minutes before transferring to a wire rack to finish cooling. Frost with royal icing, if desired. Makes about 30 - 3 inch (8 cm) cookies. For Royal Icing with Egg Whites: In the large bowl whisk the egg whites with the lemon juice (can use an electric stand mixer or hand mixer). Add the sifted powdered sugar and whisk until combined and smooth. Mix in food coloring, if desired. The icing is at the consistency for piping a border around the outside edge of each cookie. 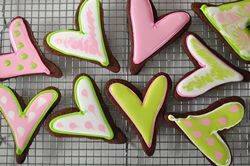 Place the icing in a piping bag fitted with a small round tip (I used a Wilton #6) and pipe a border around each cookie. Then, to cover or 'flood' the entire surface of the cookie with icing, add a little water to make the icing thinner. (The proper consistency is when a ribbon of icing that falls back into the bowl remains on the surface for a few seconds before disappearing.) Then pipe or spread the icing within the border of each cookie. Place the cookies on a wire rack until the icing dries (this could take several hours). Note: royal icing needs to be used immediately as it hardens when exposed to the air. So cover with plastic wrap or transfer to an airtight container when not in use. For Royal Icing with Meringue Powder: In the bowl of your electric mixer (or with a hand mixer), beat the confectioners' sugar and meringue powder until combined. Add the water and beat on medium to high speed until very glossy and stiff peaks form (5 to 7 minutes). If necessary, to get the right consistency, add more powdered sugar or water. Mix in food coloring, if desired. To cover or 'flood' the entire surface of the cookie with icing, the proper consistency is when you lift the beater, the ribbon of icing that falls back into the bowl remains on the surface of the icing for a few seconds before disappearing. The icing needs to be used immediately or transferred to an airtight container as royal icing hardens when exposed to air. Cover with plastic wrap when not in use. Be sure that the frosting on the cookies dries completely before storing. This may take several hours. Frosted cookies will keep several days in an airtight container. Store between layers of parchment paper or wax paper at room temperature or in the refrigerator.